Baia d'Argento is situated between the touristically well known and beautiful places of Circeo and Sabaudia, renouned for its breathtaking beach, in the province of Latina. It is a magic place where you have the incredible choice of the Mediteranean Sea, the lake, a huge forest with ancient cork oak trees and the mountain of the witch Circe. Leave Rome on the Pontina (ss148 – one of the major arteries going south and exit 26 from the ring road), after about 65 km you reach a fork, take the right indicated "Sabaudia, Terracina e Napoli", after less than 30 km you reach a roundabout, take a right turn for Sabaudia, at the next roundabout turn left (roadsign: "San Felice 10 km"). Go straight for 7 km and you will find a sign on your right "Condominio Baia d'Argento", turn there, after ca. 500m turn left into Viale delle Rose, follow the road until you get to a T junction (ca. 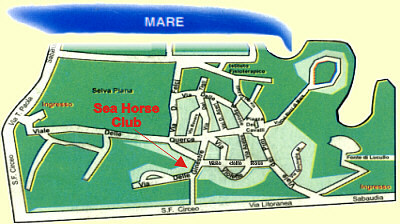 500m) where you see a sign of Via delle Ginestre 2, turn left, 50m and you'll find the Sea Horse Club on your right. N.B. : Please do NOT use the name of our street for the navigator. The coordinates for the navigator are: 41'15'00' north, 13'03'47' east. Busses leave quite frequently from Rome (Metro station Laurentina) for Circeo. It takes a bit over an hour. 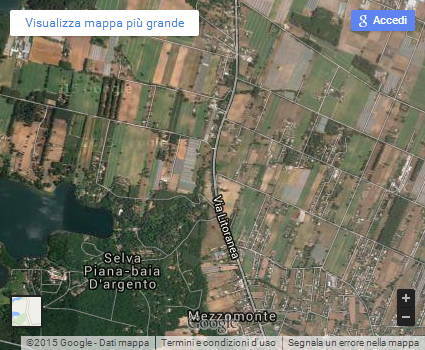 You need to get off after Sabaudia between the little villages of Molella and Mezzomonte. The bus stop is about 5 - 10 minutes walking distance from our stables. You will find the applicable time-table and price if you search for "pullman COTRAL Circeo". By air: from Ciampino or Aeroporto Roma Urbe (Via Salaria 825), 40 min flight time, for further information see Flying Club Sabaudia.